KIEV, April 11. /TASS/. Over 50% of Ukrainian voters said they planned to cast their ballots in favor of leader the Servant of the People political party Vladimir Zelensky in the presidential runoff, shows a poll conducted by the Rating sociological group. Zelensky is more popular than Poroshenko among all age groups. "He is a favorite among the residents of eastern, central and southern Ukraine. The two candidates are almost equal only in the country’s west," the pollster pointed out. According to the poll’s results, 61% of respondents expect Zelensky to become the next Ukrainian president, while 17% believe in Poroshenko’s success, and another 22% are not sure who will win the runoff. "The assessment of voters’ reasons ahead of the runoff shows that the number of protest voters has been increasing," the pollster emphasized. The Ukrainian presidential election was held on March 31. 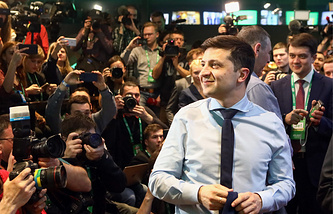 Zelensky is in the lead with 30.24% of the vote, followed by incumbent President Pyotr Poroshenko, who garnered 15.95%. Since none of the candidates managed to get more than 50% of the vote, the top two are headed towards a runoff scheduled to take place on April 21.